Who is to blame for the cyber-junk known as Johnny Mnemonic? This sci-fi attempt to cash in on the computer age and virtual reality fad is such a jumbled, confused mess. It just lurches back and forth from head-scratching idiocy to downright hilariousness. Maybe we should go down the list of suspects to determine the real culprit. Exhibit A) Keanu Reeves-Actor: Reeves plays the title character who is a Mnemonic Courier. He has a computer chip in his brain to transfer top-secret information from destination to destination. So, the character is part computer and he has lost most of his memory, therefore, Johnny is not exactly what we call charismatic. He is, essentially, uninteresting and flat. As played by Reeves (not the most expressive actor to begin with), Johnny may as well be the walking dead. No dialogue is really necessary, just a few motor skills and the rest of the story will surely follow. And when you are being upstaged by the likes of Ice-T, Henry Rollins, Udo Kier, and god help us, Dolph Lundgren, you know you are in trouble. Four years later, Reeves proved he could carry a science-fiction film with The Matrix, so the fault with Johnny Mnemonic many not reside with him. Exhibit B) William Gibson-Screenwriter: Yes, Gibson is a god in certain literary sci-fi circles. But as far as what's presented on the screen here, he may as well have written it with the help of a book called "So, You Wanna Be a Screenwriter". We have a futuristic epidemic of an imformation-based virus, called "the Black Shakes" which is contagious, but is never really explained. A yakuza type assasination group wants to kill Johnny for his head, because of the information he is carrying. It's clearly stated in the movie that Johnny can only carry a certain number of gigabytes of info in his brain or else he will induce a fatal meltdown (which if you think about it, is pretty funny considering it's Keanu Reeves), so Johnny goes ahead and does it anyway. So a self-induced crisis is created in order to get the info out or die in 24hrs. In my book, that's just stupidity and he deserves to have his brain leaking out of his ears. And what was Gibson thinking to have Johnny brain-meld with a telekinetic dolphin for the grand finale? Exhibit C) Robert Longo-Director: It's never a good idea to give such a complex project to a first-time director. And Longo proved that he was not up to the job. Scenes seem to begin and end at random, conflicts are built up and never resolved, the editing is choppy, and the cinematography is ugly and dark. It seems that Longo felt that all of the nifty computer special effects were enough to sustain what is, essentially, a very simple-minded story. To date, this is Longo's sole feature-film credit. 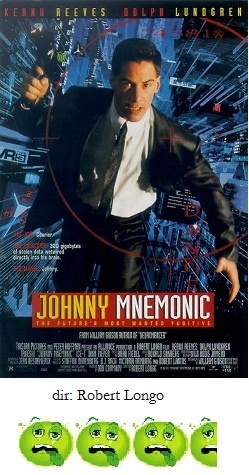 Exhibit D) New Line-Studio: There was much rumored tampering of Johnny Mnemonic prior to its release. Maybe the original film was worse, but history tells us that usually the film is better. No amount of reediting etc. by a studio can save a doomed project if the director seriously botched the job in the first place. There are just too many reasons why Johnny Mnemonic is a bust. Too many, in fact, to be able to affix blame on any one person. But since Reeves, Gibson, and New Line are still working, that would point the finger at Longo. But in my mind, they should all be forced to watch this movie until their brains leak out of their ears. Then they'll know exactly how I felt. Utterly brain-raped.